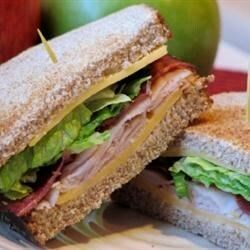 "Layers of turkey bacon, Cheddar cheese, lettuce, tomato, and mayo grace two slices of bread for this triple decker doozie. A wonderful sandwich at any time of the day." Spread a thin layer of mayonnaise on each slice. Layer bottom slice with lettuce, tomato, turkey bacon, and cheese. Spread another thin layer of mayonnaise on the cheese; repeat layers twice. Top with second slice of bread. Heat in microwave for 45 seconds to 1 minute, or until cheese is melted. Quick-and-easy chicken sandwiches star Jack cheese and bacon. Very yummy! I didn't change a thing and it turned out very well. Great for a light dinner on a summer night when its to hot to cook much. Thanks! Very easy and delicious, I would sometimes put 1000 Island spread instead of mayo.